It has been a long while since I did my last burger review! That is not to say that I have not been having my fair share of burgers! Oh no…I have certainly had my fill (even with the obligatory new year dieting restrictions)! It may surprise you to discover that this particular review is for a restaurant not commonly associated with burgers (or indeed meat in general!). Loch Fyne primarily specialises in fish of all varieties and, having sampled these fishy delights in the past, I can honestly say that the boast “specialises” is no exaggeration! Having been before, I did not feel guilty about choosing the burger – I know some folks out there will be furious (perhaps a little strong) about the fact that I went here and had a meaty burger…but as Mr Burger Journal, I feel it’s my responsibility to have a burger regardless of the type of restaurant!…so there! I had eye-balled the burger here before and it looked mighty tasty so I was practically salivating when I made my order. The waiter (thankfully) did not look at me like I was some uncultured swine for ordering this and in fact, was friendly, helpful and Italian…not sure why I felt the need to mention that last point! The starters my fellow diners and I had ordered were delicious but it was the main that I was eagerly anticipating. Finally it arrived, and I must say it looked delicious! The patty had been topped with bacon and cheese and as an added treat, had been blasted under the grill to melt the cheddar into a molten masterpiece and charred to perfection! The bun had also been toasted which I have a lot of time for! In fact, each element of the meal looked like it had been given the individual attention that it deserves. The meal was served with a metal bucket (don’t get too excited, it wasn’t that big) of chips. I feel that I should mention the meal normally comes with skinny fries (yuk) but I was presented with a “no problem sir” when I asked to replace these with the regular chunky monkeys! 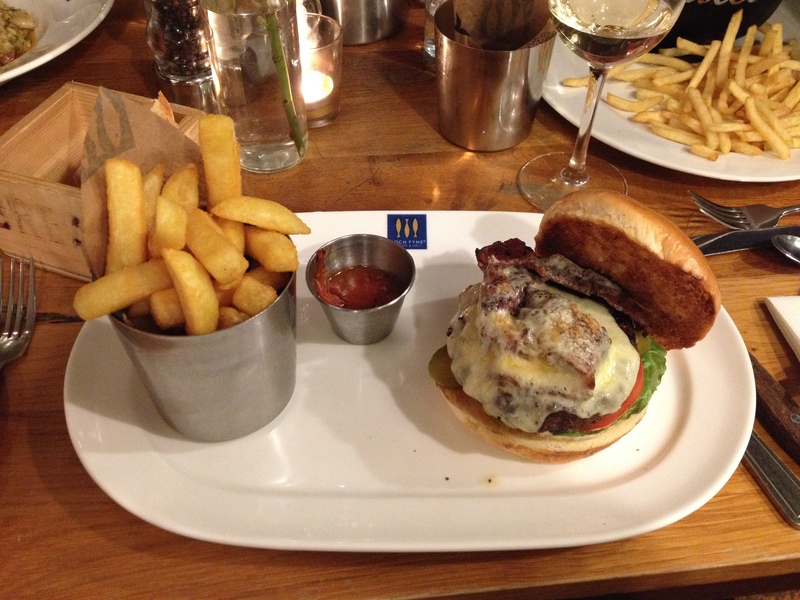 I tucked into the burger and was mightily impressed! The burger was juicy and the thick patty was extremely tasty; when you couple this with the aforementioned toppings, this was looking like a fine addition to the journal! It is, however, not all good news. 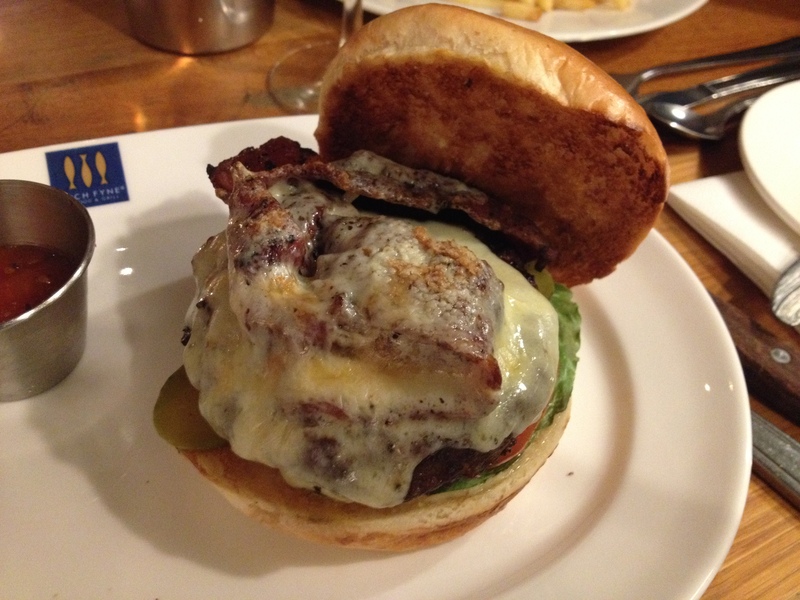 As I have already said, the burger on its own looked fantastic but the meal as a whole looked a little bit, dare I say it…boring! As regular readers will know, I’m not a huge advocate of salad but a token effort to add a bit of colour to the plate would not have gone amiss! It may not be clear from my pictures but the burger did have a little bit of colour but this was by no means the flash of “something different” that would have given the meal a more appetising appearance! Additionally, although the burger on the whole was very good, the bottom bun was a little too soggy for my liking. As I said, the burger was juicy but was not overly greasy so I am not 100% sure where the additional moisture came from…perhaps it was the salivation from earlier!? When I came to the last few bites of the burger, the crispy toasted bun I mentioned earlier, was a long forgotten memory. In summary, I was pleasantly surprised by the burger. Part of me was expecting it to be below par because of the type of restaurant but, as always, I will review the meal itself! And in this case, I can highly recommend you try the burger (but be sure to ask the nice Italian waiter if he’ll give you chunky chips)!